SY8279 10m SE of Dorchester close to the village of West Lulworth. Mupe Bay is a mile to the E.
This picturesque spot makes a neat full stop at the western end of the isle of Purbeck. The cove has been described as the most beautiful in Britain, and makes an almost perfect circle, surrounded on all sides by cliffs. This extremely sheltered bay could therefore be used in virtually all weathers, and was of course the ideal spot to sink tubs. One, a hogshead of French red, bobbed up in 1717, and was promptly seized, though it proved to be 'poor thin stuff that will not keep'. A couple of years later nearly a dozen smugglers were stopped near the cove as they tried to run wine and brandy in the early hours of a summer's morning. They fought like demons with flails, swords and clubs, and when it looked like they'd lose the cargo, the smugglers staved in some of the barrels, and made off with the remainder. The battle between smugglers and revenue men went on for some twelve hours, and attracted people from four parishes, who ran off with the abandoned barrels. In the early years of the 18th century the local venturer at Lulworth was one Charles Weeks, who lived at Winfrith, and who had developed a particularly shrewd way of defrauding the revenue. He would buy seized goods at legitimate auctions, and mix in the smuggled article for onward shipment, often to London. When an officer challenged Weeks to produce receipts showing that duty had been paid, Weeks could often do so. When he couldn't, he would threaten the officer with litigation; on the pittance paid by the government, no customs officer could afford a legal action, so the smuggler escaped. Smugglers are said to have stored contraband in a cave at the most easterly point of Mupe Bay. In 1906 it could be reached ...by following the coast from Lulworth, and by descending the cliff the moment the bay is reached. The cave is at the foot of the precipice, at a spot where a little channel has been cleared between the boulders for a boat to land. Sacred to the memory of Lieut Thos Edward Knight, RN, of Folkestone, Kent, Aged 42, who in the execution of his duty as Chief Officer of the Coastguard was wantonly attacked by a body of smugglers near Lulworth on the night of 28th of June 1832, by whom after being unmercifully beaten he was thrown over the cliff near Durdle Door from the effects of which he died the following day. The route that contraband followed inland from Lulworth went directly through the village of Wool, where in the 1820s the landlord of the Ship Inn, Tom Lucas, supervised onward shipment and storage. He was a formidable man, and his associates were notorious for their violence. 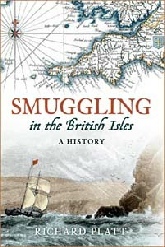 The following extracts are taken from the Smugglers’ Britain website by kind permission of Richard Platt, author of ‘Smuggling in the British Isles - A History’.